Last night, we went for dinner in Barrington at Ciao Baby. This is a small local Italian restaurant. They have gluten free pasta, and other preparations for the gluten free diner. 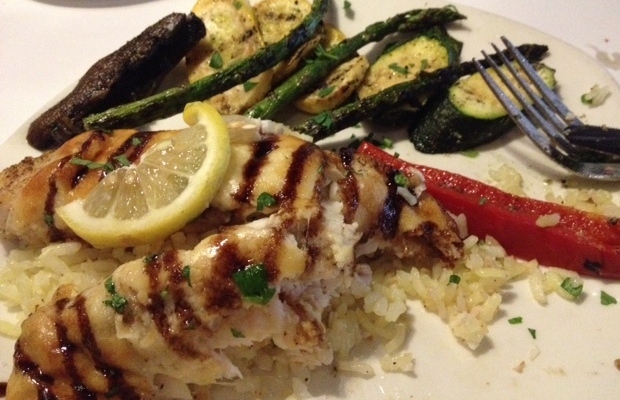 I ordered a daily special from the chalk board – a Parmesan-crusted tilapia. The presentation was very nice, and I very much enjoyed the meal. The tilapia was placed on a bed of sticky rice, and the grilled zucchini, asparagus, peppers, and mushroom added a colorful and tasteful accompaniment. This entry was posted in Restaurant Review and tagged Barrington restaurant, Ciao Baby, gluten free, gluten free pasta, Italian restaurant, Parmesan-crusted tilapia, sticky rice on September 11, 2014 by goforsix. My introduction to traditional Chinese cooking. Several months ago, the house next door was purchased by a Chinese couple. After giving them some time to settle in, I went over with a small welcome gift – a house plant and a bottle of wine. I was warmly greeted by the wife, who spoke little or no English, and subsequently met the rest of the family – her husband (who does speak English), and their son and daughter, who are in elementary school. They brought over a gift basket that was very generous. Over the intervening winter months, we have kept in touch, mostly by email between myself and the husband. He let us know that his wife was taking English classes, and wondered if I would be available to spend some time visiting with her to give her an opportunity to improve her command of English. I was excited at the prospect. This last week, I had my first get-together with them, to discuss a general plan. We had a pleasant visit, and they gave me a package of Chinese tea, along with a mesh tea-ball. This week, I had my first actual session. This relationship promises to be very rewarding – not just for her, but for me too. She will gain more fluency in English, and have a friendship with a neighbor (she currently has no friends here), and I will enjoy the warmth of her wonderful personality, have a new adventure, and an exposure to some traditional Chinese cooking. At the end of our visit earlier this week, she presented me with food she had prepared for her family, a dish called zongzi . It is a traditional Chinese food – a dumpling made with sticky rice, with pork or beans, wrapped in bamboo leaves and cooked with steam.” She gave me several dumplings to take home and share with my husband. 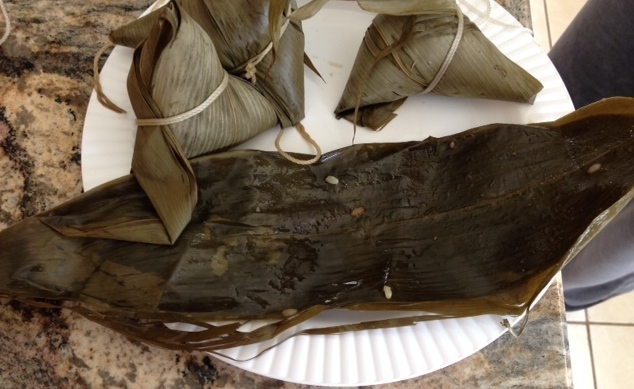 This photo shows three zongzi still in their bamboo leaf wrappers, and one bamboo leaf that has been removed from the contents. Apparently, the string can be tied in such a way as to indicate whether the contents are bean- or meat-filled. The recommendation is to serve the bean/rice dumpling with a sweetener – sugar or syrup. 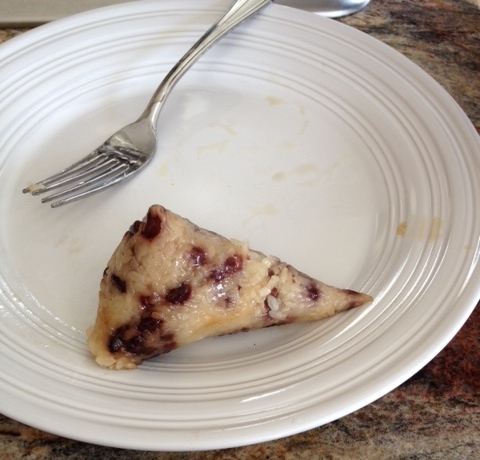 I thought the dumpling was rather bland, and it did benefit from the addition of agave nectar. 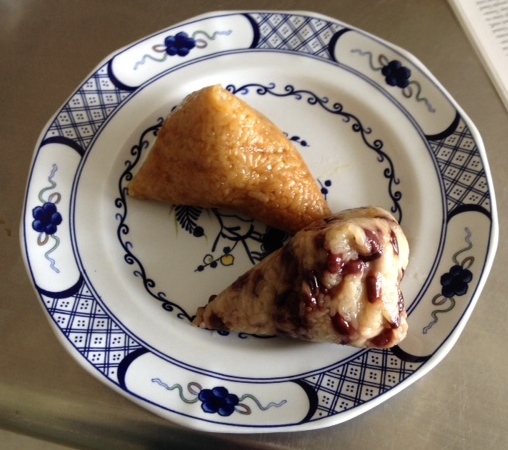 The flavor of the dumpling with the meat was a bit unusual – not at all like other rice and meat dishes I’ve had. I was interested in finding out more about these dumplings, and spent some time reading about them on the internet – so I’ll have occasion to learn too. She is aware of my gluten free issues, and is eager to cook for me. I will have to plan on some American dishes to prepare for her. My neighbor is a charming woman who is very dedicated to raising her children well. She is very determined to become fluent in English. She listens to CDs, and reads with her daughter. I’ll report back on my experiences with her from time to time. This entry was posted in Traditional Chinese Food and tagged bamboo leaves, Chinese food, Chinese neighbor, dumplings, English classes, gluten free, neighbor, speaking English, sticky rice, traditional Chinese food, zongzi on May 7, 2014 by goforsix.